Last Sunday afternoon I had a sudden craving for waffles. Even without hot cherries, whipped cream and vanilla ice cream hot waffles dusted with icing sugar are just so tasty. And so quick to make. This time I also tried out something which I have been wanting to do for ages: Using ground flaxseed (aka linseed) as an egg replacer. Although I have baked cakes using flaxseed, like this chocolate cake from Gretchen, before, I have never just exchanged eggs in an existing recipe. And my usual waffle recipe uses 5 eggs! The common measurements are 1 tablespoon of ground flaxseed and 2,5 tablespoons of just boiled water. Mix them together and leave the mixture to thicken for about 10 minutes. I always use my spoon-measuring set when working with “teaspoons” and “tablespoons”. Such a useful kitchen tool. Optional: I had some chickpea water (aquafaba) left over from another recipe. Whipped up it’s just like egg white. I folded it into the waffle batter. This is an optional ingredient. Mix ground flaxseeds with hot water, stir and leave to thicken for about 10 minutes. 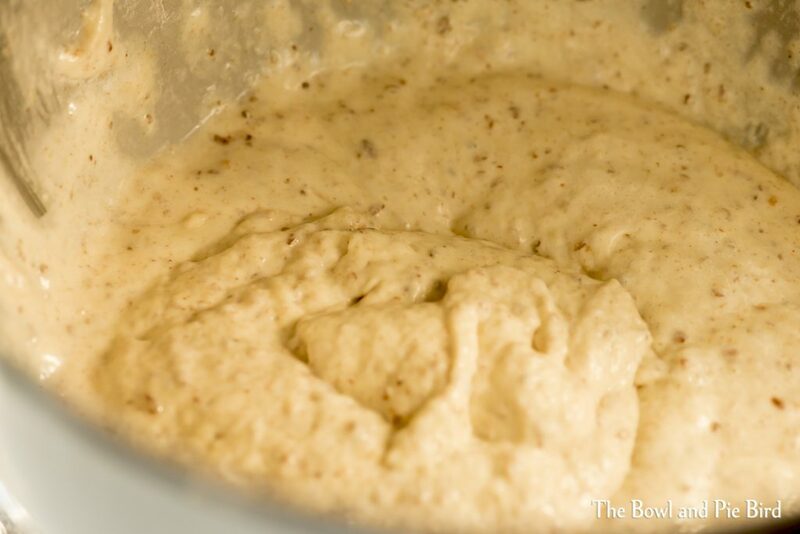 Turn down speed of your mixer, add flaxseed, two tablespoons of flour and the vanilla extract. Turn up speed and mix until combined. Add remaining flour and mix until combined. Slow down speed and gradually add milk. 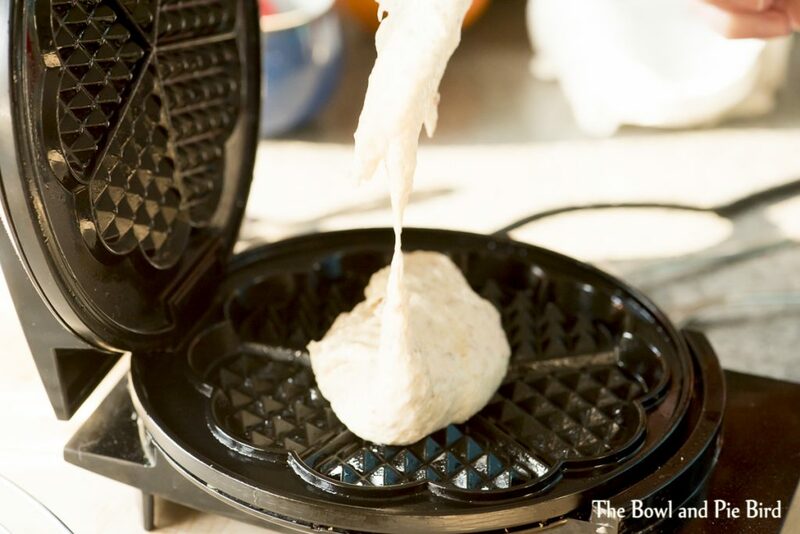 Increase speed to medium and beat until you get a smooth batter. Optional: Fold in your whipped aquafaba. 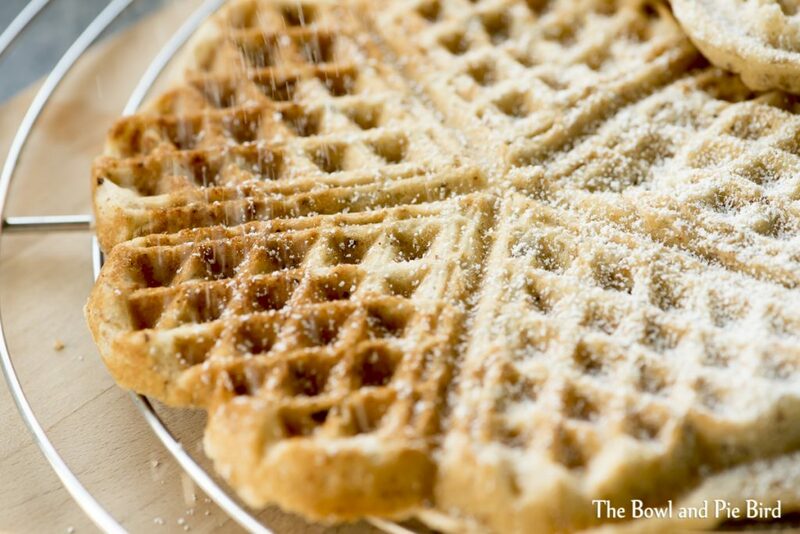 Bake your waffles in your preheated waffle maker and serve hot with a sprinkle of icing sugar. The waffles tasted slightly nutty from the flaxseed. Also I used 250 g normal flour and 250 g wholemeal spelt flour so the waffles were a little firmer and very filling. My husband didn’t notice that they were made without eggs and neither did I. So my experiment was a full success and I’ll be baking my next waffles like this too. This entry was posted in Desserts and tagged vegan; waffles; Waffeln; aquafaba.